KANSAS CITY, Mo. — A Missouri-based Islamic charity that was shut down after being identified by the federal government as a global terrorist organization admitted in federal court Wednesday that it illegally funneled $1.4 million to Iraq in violation of U.S. sanctions. A representative of the Islamic American Relief Agency pleaded guilty in Jefferson City, Missouri, to conspiring to violate the International Emergency Economic Powers Act. The agency, once based in Columbia, also pleaded guilty to one count each of conspiracy to commit money laundering and obstructing the administration of internal revenue laws. At least three former IARA principals — the group's chief, a fundraiser and a board member — have previously been sentenced in the wide-ranging scheme to illegally transfer money, and a former Michigan congressman went to prison for lobbying efforts for the group. IARA, which served as the U.S. office of the Sudan-based Islamic Relief Agency, took in between $1 million and $3 million in contributions annually from 1991 to 2003, federal authorities said. The group was closed in October 2004 after being identified by the U.S. Treasury Department as a specially designated global terrorist organization. After being indicted in 2008, IARA was reconstituted to resolve the criminal matter that led to Wednesday's guilty plea, though the group and its governing board have agreed not to form a successor. As part of the plea, IARA admitted it secretly funneled $1.375 million in cash or merchandise to Iraq in violation of United States economic sanctions dating to 1990. Authorities described Hekmatyar as an Afghan mujahedeen leader who has participated in and supported terrorist acts by al-Qaeda and the Taliban. It wasn't immediately clear who received the remainder of the money. A spokesman for the region's federal prosecutor's office couldn't immediately be reached. Prosecutors also said IARA wrongly used its tax-exempt status to solicit funds, representing them as legitimate charitable contributions. 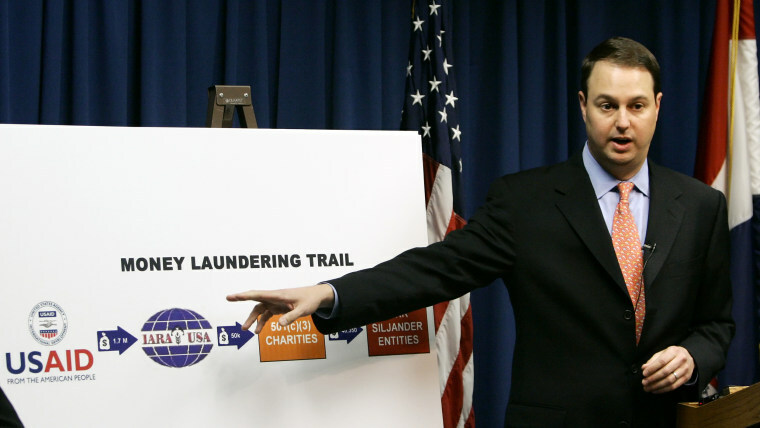 In 2012, a former Michigan congressman and U.S. delegate to the United Nations was sentenced to a year and one day in prison for lobbying for the IARA. Mark Deli Siljander, a Republican who served in Congress from 1981 until 1987 and as a United Nations delegate for a year, acknowledged he lobbied in 2004 on behalf of the IARA for the organization to be removed from a U.S. Senate Finance Committee list of charities suspected of funding international terrorism. Siljander also admitted he failed to register as an agent of a foreign entity and had lied to FBI agents and prosecutors acting on behalf of a federal grand jury. IARA's former executive director, Mubarah Hamed, a naturalized U.S. citizen originally from Sudan, is scheduled to be released next month from a nearly five-year federal prison term for illegally sending more than $1 million to Iraq through the charity, and two IARA fundraisers have received to probation for their role in the conspiracy.